I am a historian of Russia with expertise in cultural history and emerging interests in animal studies and environmental history. My current research projects include studies of the Soviet space dogs, the significance of the Belyaev fox domestication project, and the cultural implications of domestication, particularly in Eurasia. To celebrate the completion of some pretty terrific research on domestication we planned an end-of-term food fest to honor the animals we have studied over the course of the semester. The crew assembled here is ready to dive into a smorgasbord of food for, derived from, or inspired by the domesticates they researched and wrote about this semester. The projects – which focus on the Honeybee, Goldfish, Pigeon, Chicken, Cat, Donkey, Horse and Reindeer,are available from the research project menu on the main blog page. The Menu: Earl Grey tea with honey represented Bill’s fine study of the honeybee. Horses would have had stiff competition from us for the apples and caramel dipping sauce Camilla brought. Alex paid homage to the donkey with ginger snaps (because watermelon is not in season), while Connor prepared a bowl of delicious fresh berries and gummy worms as pigeon food. Chris also played with the symbolic, bringing goldfish crackers and milk to represent the house cat. My own approach to this assignment was synthetic. I tried to include something for everybody in the “Domesticate Cookies” I made. Ben and Casey took the creative route, crafting reindeer cookies and goldfish marshmallows that would be the envy of any domestic god or goddess. And then it was time for awards! (I’m very sorry I didn’t get photos of the winners modeling their prizes). The finalists for “Best Video Featured on a Research Project Blog” were: 1) “Which Came First, the chicken or the Egg?” 2) George Carlin on Cats and 3) The Amazing Trick Goldfish. Scroll all the way down on the goldfish page to find the winner, also pictured here with his culinary handiwork. The finalists for “Best Poem Featured in a Research Project Blog” were: 1) An ancient Egyptian Ode to embryos (and eggs?) 2) A honey-themed excerpt from the Illiad and 3) “Cher Ami,” a poem written to commemorate the feats of a pigeon hero of the First World War. Following enthusiastic dramatic readings of all three entries, Cher Ami emerged as the winner of this coveted award. A discussion ensued over the Best Overall Research Project Design, and while there were many good candidates, the group quickly settled on a winner. The prize goes to….drum roll, please…….THE CHICKEN!!!! With deep appreciation of your contribution to the class this whole semester, your insistence that we always keep an eye on our moral compass, and your uncanny ability to raise the bar for all of us, Erica, we want you to come claim your prize, please. Jonathon Burt’s introduction to Rat prompted many of us to think long and hard about why our 21st-century American reactions to a ubiquitous rodent are so strong and so negative. Looking at the rat in other contexts provides a somewhat different perspective. For example, the Rat is the first animal of the Chinese horoscope cycle. The Rat conveys many positive qualities to people born under its sign, including leadership, charm, passion and practicality. Year of the Rat people might also be cruel, controlling and exploitative, which reminds us that good and evil are inseparable. One requires the other, and problems arise when balance is disrupted. Other cultures have a more practical approach to mice (which belong to the same sub-family of the rodentia order as rats — the murinae). In Malawi poached mice on sticks (captured in freshly harvested corn fields) are considered a culinary delicacy. Our readings by Karen A. Rader and Kenneth J. Shapiro present us with a good analytical framework for thinking about how the process of domestication shaped human-rat (mouse) interactions over the last century or so. Camilla and Ben have some excellent insights about how rats double as humans, serving as models for humans in biomedical experiments, and anthropomorphic citizens of parallel societies in young adult fiction. Ai Wei-Wei’s zodiac rat, pictured above, portrays the ambiguity of the rat-human divide more powerfully than many words could. Disney’s Mickey, the world’s most famous mouse has long provided scholars with insight about a creature, who in Karen Raber asserts “redefines or challenges conventional zoological and social understanding” (p. 389). Stephen J. Gould’s 1979 essay on neotony still provides an excellent jumping off point for those wanting to learn more. I’m intrigued by the nexus of domestication, affection, revulsion, and technology we find in contemporary American attitudes about rats and mice. Connor makes some good points about the importance of these rodents to scientific research, and I agree that the contribution to human welfare these animals have made is significant. I think it’s important, however, to consider Shapiro’s and Raber’s analysis closely – regardless of what one thinks about the ethics of animal testing. In Shapiro’s article, we find a nuanced dissection (sorry!) of the synergy between the development of the concept of the “lab animal” and the domestication of rats for that purpose. The application of selective breeding, specific kinds of socialization, and the creation of new “habitats” / confinement systems facilitated the emergence of the domestic lab rat (from the Norway rat) and articulated and shaped the meaning (social construction) of those animals for researchers and human audiences outside the lab. Shapiro’s assertion that rodents make poor models for humans, especially in psychological research presents us with some uncomfortable questions, as does Donna Haraway’s concept of the “cyborg” animal, which is equal parts nature, culture, and technology (think OncoMouseTM). Finally, for all of their negative cultural baggage, stigma as vermin and unwilling contribution to scientific research, rats can be that most favored of American creatures – the domesticated pet. Rats are clean, sociable, and come in a rainbow of colors. Unlike other rodents sold in pet stores, they rarely bite, and are excellent companions for young children. The first two rats our family adopted were rescued from the snake food tank at a local pet store (our enthusiasm for raising domestic animals to feed captive wild animals would also be worth thinking through more carefully). In their two years with us they provided endless hours of entertainment and companionship, loved nothing more than to snuggle into a pocket for a nap, and displayed remarkable calm in the face of the cat’s obviously predatory intentions. If they could write about their histories with us, I wonder what they would say? You sure don’t want to miss Connor’s post! Read it here. I’ve tried manually updating the feed from his blog, but am not getting very far. I will keep working on it. There were so many good papers and interesting, accomplished people at the Living With Animals Conference at Eastern Kentucky University! One rarely finds such a collegial, kind, smart, and diverse group coming together around anything — much less the issue of animals in the academy. So this meeting was truly a treat. I definitely can’t do the whole experience justice in this post, so I’ll just touch on the highlights: Every session I attended kept me riveted for the duration. A “Living with Horses” session on Thursday addressed the subtle and profound issues of helping people and horses who fall on hard times through Equine Rescue services, as well as the changing paradigms and ethics of enlisting horses in therapeutic interventions for humans. The third paper in this session used Jane Smiley’s work, especially her fiction for juveniles, to consider the ways children and horses both function as “live property” in the contemporary United States. Friday began with a wonderfully rich and entertaining presentation by Margo DeMello, about teaching “Human-Animal Studies.” This theme carried over to the session where I talked about our blogging project. I also learned about how to incorporate animal studies into a first-year seminar with a service-learning component, how the occupational therapy program at Eastern Kentucky University engages a broad spectrum of learners (and horses), and how inquiry-based learning (using the Project Dragonfly QUEST model) can be used in an animal ethics course. The afternoon was devoted to Animal Subjectivity. Pamela Ashmore’s presentation raised many troubling questions about the often noble goals and incredibly high physical and monetary costs of taking non-human primates into the home as “pets.” Even more confounding, was Lynn White Miles’ paper about the thirty year journey of Chantek the baboon from research subject to enculturated child, back to research subject, and then (currently) to exhibition object (at the Atlanta Zoo). The highlight of the day was a round table session about setting up Animal Studies programs featuring Bob Mitchell, conference organizer and founder of the Animal Studies major at EKU. This is the first major of its kind, and will produce its first graduates this spring. The curriculum is rigorous, practical and elegantly balanced: Students develop in-depth competence in Arts and Humanities (courses such as Animals in History, Animal Ethics, Cultural Anthropology), they gain a solid footing in the sciences with coursework in zoology, ecology, comparative psychology, human evolution, etc., and they complete an “applied” concentration in conservation, animal science, and animals and the law. Capstone coursework and options for field study and study abroad provide the flexibility and focus for an academic experience grounded in the three major elements of Animal Studies: study of the animal, study of human interactions with animals, and study of relationships between animals and people. I had to leave mid-day on Saturday to avoid driving through the spring snow storm that swept off the flatland and into our mountains this morning. I hated to miss the tour of the Kentucky Horse Park today, but was grateful for the chance to hear Ken Shapiro’s final keynote about the future of Human-Animal Studies and some very compelling papers before heading home. These included Jessica Bell’s analysis of how the new “naturalization” of the circus in major media outlets invokes discourses of conservation, animal protection, and domestication to legitimize the exploitation of animals, especially elephants. Jeannette Vaught’s presentation on the connection between commercial horse slaughter and private horse cloning raised a host of issues, none of which sit easily with popular conceptions of equine sport, biomedical advances, and the monetary “value” of individual horses. The shifting sands on which equine capital is evaluated and which determine the fate of race horses at the end of their career received nuanced and sophisticated analysis from Tamar Victoria Scoggin-McKee, whose fieldwork with Thoroughbred Ex-Racehorse Rescue promises to produce a fabulous dissertation. Scoggin-McKee also provided a thorough update on the conference via Twitter (#livingwithanimalseku). As academic conferences go, Living with Animals has been just fabulous. A full update will have to wait until I am reunited with a full keyboard, but I can’t call it quits on the day without noting how invigorating and exciting it’s been to hear terrific papers, share ideas, and talk about our blogging project with a diverse group of kindred spirits. Thanks, UH3004 for taking on the “blogging domestication” project with me! I enjoyed our discussion of canine-human evolution yesterday, and wanted to circle back to our fascination with the paleolithic past. Chris gave us excellent context on the appeal of the “edenic / authentic paleo” in current health and fitness trends, and I think we all appreciated the nuances of his post and questions. What I wanted to come back to here are the connections between historical thinking and how we invoke an imagined past to help us move forward in an increasingly fraught present. I appreciated how Marlene Zuk’s recent article reminded us that efforts to get back to a more “pure,” “healthy,” or “natural” lifestyle invoke a static ideal that never existed. Evolution isn’t over. Like domestication, it is an ongoing process. Paleolithic people may have had less heart disease and lower cholesterol, but they weren’t necessarily more “healthy,” or “better adapted” to their environment than we are. Like other organisms they were making their way the best they could. Some of them eventually domesticated grains and abandoned hunting and gathering for a settled lifestyle that we see both as the beginning of “civilization” and the end of a naturally healthy lifestyle. At the same time, though, many other people became and remained nomadic pastoralists, with all of the dietary and cultural baggage that entailed. As historians, we need to remember that utopias are just that — imagined, idyllic, impossible communities. We invoke them into being to validate our analyses of the present and legitimize our agendas for the future. I’m quite sure that many of us would benefit from exercising more and eating less processed food. But to imagine that paleolithic people had a more “natural” lifestyle than their contemporary descendents is to take them out of history and deny the continuity of evolution. The discussion about Erica’s terrific post about (among other things) milk and the Mayan apocalypse reminds me that fermented beverages are important, not just to the social lives of contemporary college students, but to the ancient and enduring practices of pastoralism on the Eurasian steppe. 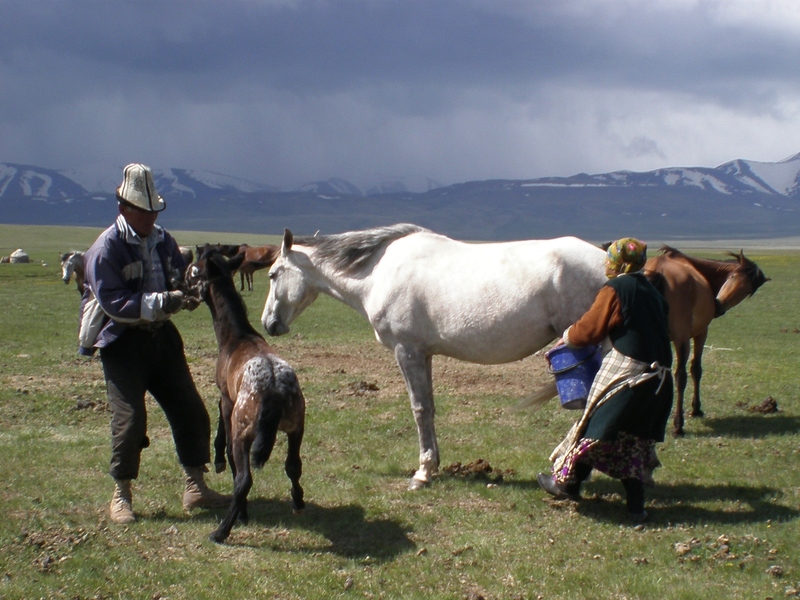 For many people of Turkic and Mongol origin, kumis an alcoholic beverage made from fermented mare’s milk was (and still is) a dietary staple. For those of you who are wondering about the logistical challenges of milking mares, here is captivating, contemporary account. (BTW, the foal in this image has the same kind of leopard spotting found in the Pech Merl image on our mother blog!) And fear not, city dwellers, and others who don’t have access to their own mares, can also imbibe kumis from a bottle. Kumis’s relative from the Caucasus, kefir, is made from goat, cow or sheep’s milk, and I have fond memories of scouring the stores of Moscow for it in the hungry days of the collapse of Communism. Urbanization and industrialization did cause many problems in terms of maintaining a supply of healthy milk. It’s doubtful that we would have traded beer for kumis, even without the advent of Pasteurization, but it’s worth remembering that Ghengis Khan’s warriors drank their kumis. The intensity of the group’s responses to HHH gave me pause – mostly of the good kind. Although we rejected many of Bulliet’s claims, it’s clear that the conceptual categories of “pre-domestic, domestic, post-domestic” got us thinking about our contemporary sensibilities in new and provocative ways. So, from my perspective, this was a good day! I am a native of Western Kansas. My father’s family homesteaded in Smith County, a vast mesa of prairie earth at the geographic center of the continental US. My childhood revolved around summers spent on the family farm (then in Southern Missouri), where I helped slop hogs, feed chickens, and tend calves, and spent endless hours fussing over the horses and pony that drew me away from the air-conditioned comfort of suburbia to the sweltering humidity of the fields. I ate meat. Lots of meat. Most of it came from animals raised on the farm. I thought it was perfectly normal to have a freezer in the garage full of beef and pork. Mine was a “domestic” upbringing, even if I’m too young to have experienced the full-blown era of domesticity Bulliet describes. I loved animals. I had pets from wood, field and stream as well as dogs and cats. And I ate animals. Lots of animals. I did have qualms, though. My grandfather gave me a calf every summer and I always chose a heifer, partly so my herd would expand and partly because I knew cows were more likely to remain in the pasture for several years than steers were. When I went to college in California, my grandfather sold my herd off to help pay my room and board. I tried not to think about where my cows ended up — I had raised them and watched over them for many years. At the same time I encountered what passed for meat in a college dining hall. I was not impressed. So I quit eating it and discovered that all of the non-meat food that had never been part of our hamburger / pork chop cuisine was really tasty! I didn’t really miss meat, but when I went home for Christmas, my mouth watered at the prospect of a good steak dinner. I couldn’t finish the steak. It tasted greasy and heavy and made my intestines very unhappy. I waited a couple days and tried a hamburger. Same problem. I was bummed. And then it occurred to me that this wasn’t a bad thing. Like most people, I ate meat because I liked it. Once I no longer liked it, and eating it made me feel sick, an array of rationales for the new normal appeared. The main one was the unnecessary killing – sacrificing creatures, some of whom I knew as individuals, just because I wanted to eat them seemed senseless and selfish. I wasn’t much worried about the “factory farm” issue at that point. The livestock I knew ranged freely, ate well, raised their young themselves, and did not fear predators. I just realized that I found living animals more attractive than dead ones. I was also impressed with the work of Francis Moore Lappe, and welcomed the prospect of helping people and the environment by eating lower on the food chain. I was also powerfully impressed by how terribly my gut hurt when I ate that steak. How could meat be good for you if it made you feel so awful? And so, more than thirty years ago, I slipped into vegetarianism; not, as Bulliet would have it, out of a “post-domestic” revulsion over imagined animal suffering and death, and estrangement from actual livestock.(cf. pp. 15-18). No, the shift for me was facilitated by an entirely unintended consequence of foregoing something previously tasty long enough to (accidentally) lose the taste for it. With the desire to eat meat gone, it was easy to reject nearly all of the philosophical moves and practical ploys that put it on my plate in the first place. There’s more to my “domestic” evolution in the era of “post-domesticity,” but it will have to wait for another evening. Wonderful discussion of silkworms, the cave man diet, the nutritional superiority of wheat and barley, and many other good things today! I’ve added a couple of links about the stray dogs in Moscow for your reading / commenting pleasure. There’s so much to chew on in Erica and Camilla’s post, Domestication, energy, geography…and how things came to be….The cattle staring at us from Erica’s blog page seem to agree. I’m especially appreciative of the quote from Russel’s article: “To biology, history offers an understanding of the social forces that create selective pressures. To history, biology offers understanding of the ways organisms respond to such pressure. Together, as evolutionary history, they offer an understanding of the ever changing dance between humans and nature.” I like that this quote urges us to see history and biology as intertwined, ongoing, and in process. Rather than the chicken-egg debate or before and after paradigm, or the civilization vs. nature perspective, evolutionary history invites us to examine an elegant, ever-unfolding dance.